Vancouver was home to the 2010 Winter Olympics, and you will drive past the Olympic Speed Skating Arena as you drive away from the airport. Downtown Vancouver wraps around the beautiful natural harbor that is a very busy port. Sea-faring ships and seaplanes arrive and depart almost constantly. 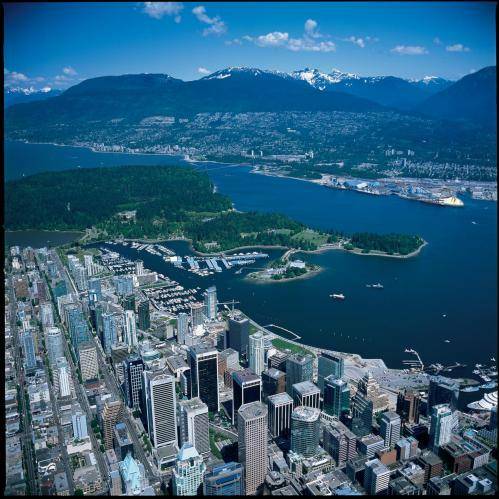 Scenic flights in the seaplanes, as well as the Seabus and SkyTrain are among the most popular attractions. Stanley Park is a beautiful 1000 acre retreat on the harbor shore to the west of town, and is one of the largest city parks in North America. At 9:00 in the evening, a canon is fired from the shore of the park. The Capilano Suspension Bridge and park features 27 acres of evergreen trees and authentic totem poles with a total of 8 suspension bridges for foot traffic to walk among the tree tops and enjoy the view. Nearby Granville Island features a public market that attracts over 12 million people a year to buy everything from farm-fresh meats and vegetables, to rare mushrooms, cheeses, and sausages made on-site. Well known for restaurants, culture and nightlife, Vancouver is a very diverse and cosmopolitan city with its own Orchestra, Ballet Company and incredible selection of museums. Just north of town is the “Highway to the Sky” that takes you to the Olympic Village and ski resorts of Whistler. The winter sports in Whistler are well known, but the summer sports at the ski resort are fantastic. Hiking, mountain biking, fishing, boating, zip-lines and golf are all world class. Vancouver Airport (IATA: YVR, ICAO: CYVR) is just south of the city in the town of Richmond. All of the general aviation facilities are on the south side of the field, near the seaplane terminal. All of the facilities have rental cars as well as limousines available and are open 24 hours. Contact Desert Jet to arrange your next charter flight between Vancouver and Palm Springs at (760) 399-1000 or email charter@desertjet.com.